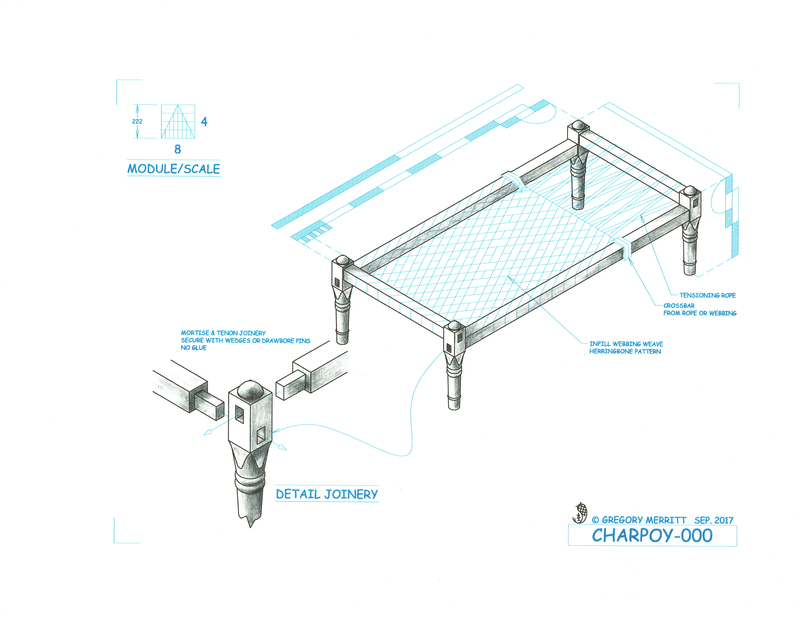 The charpoy is really a simple piece of furniture. Four legs with four rails mortised into them. The platform upon wich you sit or lay is woven from cord or cloth webbing (tape). The charpoy can also be quite elaborate. The legs can be turned and/or carved as well as elaborately painted. The weaving can be a simple over-under pattern or the pattern can be extremely intricate. 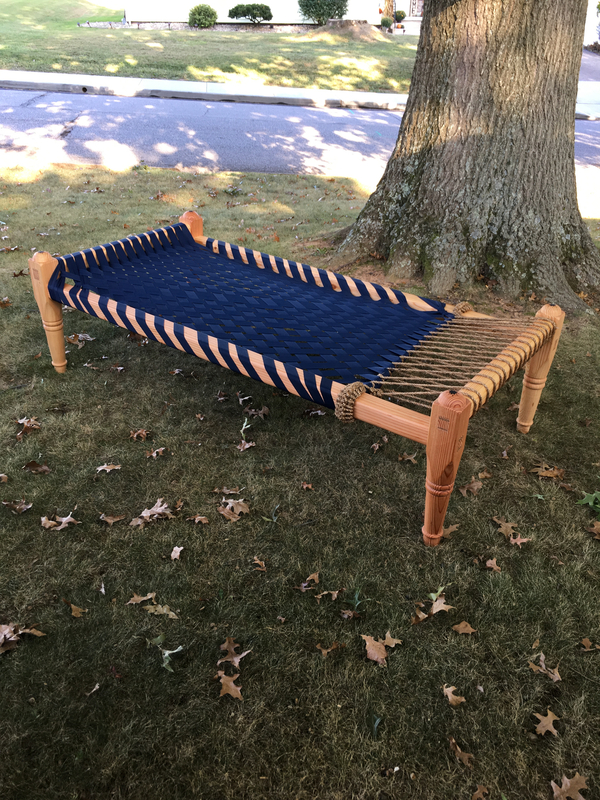 The weaving element is my focus for finishing out this charpoy build. As I said before, finding detailed instructions on how these things are built and woven has been almost impossible. For the most part I have relied on photos and videos. Most of which only show portions of the process and are in a language that I do not understand. There are a few bits of information that I have been able to gather, but a lot is conjecture and educated guessing. The traditional infill of the charpoy is woven from twine/cord/rope made of jute, palm or cotton fibers. More modern variants are woven from synthetic webbing or cord. Each has advantages and disadvantages. 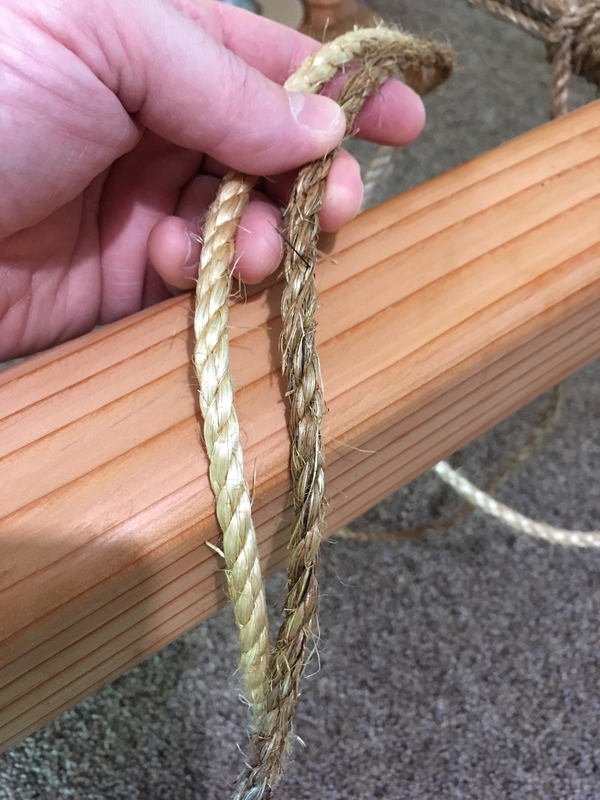 Natural fiber cordage creates an airy open weave. An important attribute in India’s hot humid climate. It is also biodegradable. The downside is that it is relatively expensive. It is also more time consuming to weave the few thousand feet of cord to complete the infill. Natural fibers are also susceptible to exposure to the weather. Synthetic webbing/tape (preferably polypropylene) is relatively inexpensive and readily available. It is also much faster to weave a charpoy with the wider webbing. The synthetic webbing is also much more durable when exposed to the weather. The downside is that synthetic webbing tends to create a much more closed weave and doesn’t breathe all that well. The third option is to use a synthetic twine/cord/rope. Much cheaper than natural fibers, but still can be expensive due to the volume needed. Judging by photos and videos, synthetic webbing has become the most popular material for weaving charpoy. This is closely followed by synthetic twine. Charpoy woven with natural fibers seem to be few and far between. The choice of material seems to vary with region as well as economic position throughout India and Pakistan. There is one other aspect of the weaving that we need to discuss. In several examples I noted that the woven portion did not extend the full length of the charpoy, but terminated at a crossbar made of either rope or webbing. That crossbar was further secured to the end of the charpoy with ropes. It took me a while to understand the “why” of this arrangement. After way to much head scratching I realized that it was a means to tension the weave. The weave will stretch with use, especially when first put into service, and the tensioning arrangement allows for easy adjustment. I chose to use webbing for my charpoy. All said and done, the biggest hurdle was finding webbing in the required length of about 230 feet. There is a big, long convoluted story involving FleaBay and the big A, but the short version is that I ended up with two supplies of webbing. One made from synthetic poly and the other from jute. Neither was of the continuous length that I needed. So a splice was required no matter what. I began the actual weaving by construction the “crossbar” that is the anchor point between the weave and the tensioning ropes. 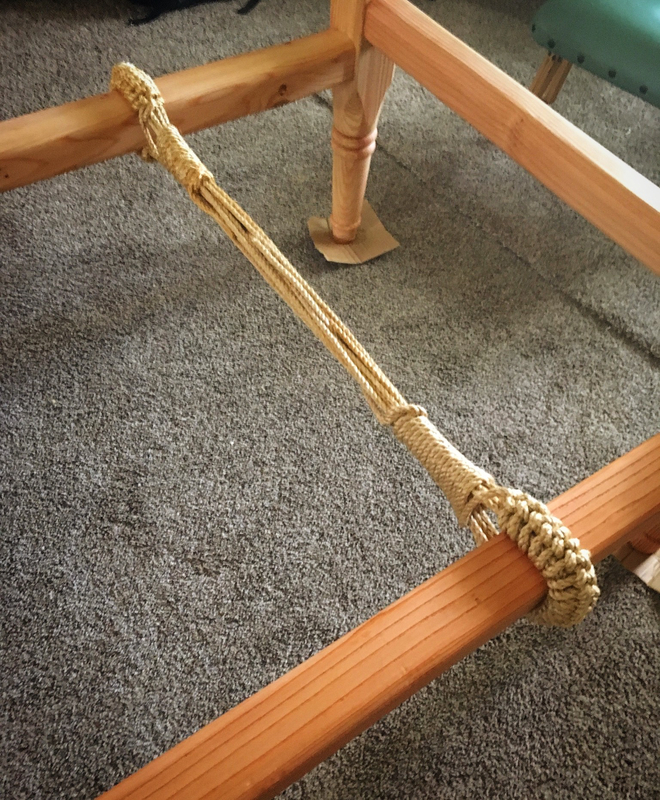 This I made from 1/4” Manila rope. The bits that wrap around the rails looks complicated, but it really is just a series of half hitches. I ran short of rope and had to order more from the same supplier. What came (right) looked quite a bit different from what I had originally (left). So, I started over so all of the rope work would match. The weaving turned out to be very simple. I have tried several times to create an instruction drawing, but it is just too simple. Sort of like trying to write a book on how to ride a bicycle. Anyway, I used the poly webbing and the weaving went smoothly. In use, the poly webbing proved to be noisy. It squeaked as it rubbed over itself. This garnered many complaints from management and the boy. So I pulled it apart and rewove it with the jute webbing. Not as flashy, but it is quiet. 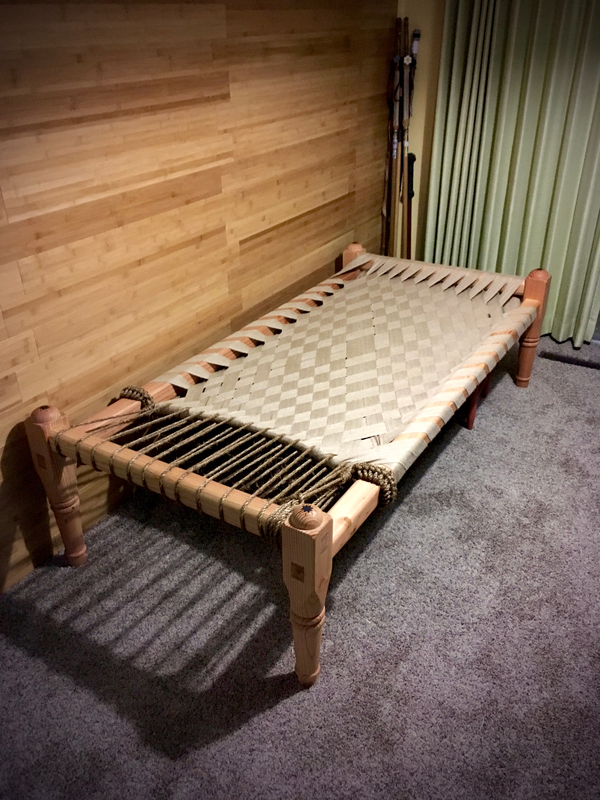 I have slept on this charpoy several times now and it is very comfortable. I really like it and my back seems too as well.. This entry was posted in Charpoy. Bookmark the permalink. I remember sleeping on these in India and Afghanistan (We even had a double-wide.) and remember them fondly. With a lite futon they make a very snug bunk. Where did you get the jute tape? The jute webbing is from an upholstery supplier on Ebay. It is the stuff they use to secure springs and such in upholstered furniture. This bed is why the phrase “sleep tight” was coined as it was speaking of the ropes. Nice post! Thanks! And thanks for the history tidbit. Love it and it looks to be real comfy too. That’s the same species of pine I used to make the planter box. I was trying to find what type of species of pine it is, but really couldn’t put my finger on it as they were several that were too similar to each other. So do you know what type it is? Btw Welcome back, I was going to write to you to see how you are. Thanks Salko. The wood that I used for this is fir. Fir? Where I got mine from it said pine but it’s structural crap that I air dried for a couple of months before I used it. Damn did they get it wrong? The blog will always be there so tie up your loose ends first. It looks great, Greg! … your usual fine work. Thank you Bob. 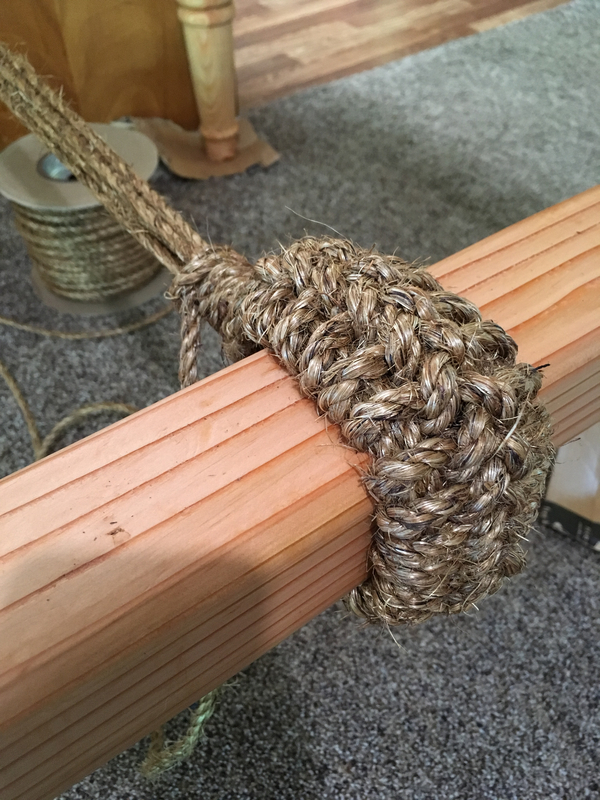 The rope tensioning end is traditionally the foot end. It looks like it would be a nuisance, but in use it works just fine. Especially with a blanket thrown across it. Long time no read, Greg. Looks like the Charpoy came out great. And if it makes your back feel better, then that’s a bonus! Hey thanks Matt! It really is surprisingly comfortable. Thank you for all the details! This was really cool to see! Very detailed and thorough work and illustrations !How much webbing will be needed for one about the size you made and how is the supplier? Thank you! It takes between 200-230 feet of webbing to weave a bed of this size. There are a lot of suppliers offering bulk webbing for online purchase. I have obtained webbing thru Amazon and eBay. The blue was 1-1/2” and the brown 2”. It takes a minimum of 250ft either way.